THE Stagewise 2018 summer workshop, running from 1st to 7th August for children aged from four to 11 years, this year focuses on circus. Jamie Jigsaw will lead The Greatest Summer Workshop, at Wimborne Comm­unity Learning and Resource Centre, from 1st to 3rd August and at the Priory School in Christchurch on 6th and 7th August. The participants will experience the thrills and spills of the circus at the same time as learning new skills in singing, dancing and acting, with musical numbers from The Greatest Showman, Barnum and Dumbo. 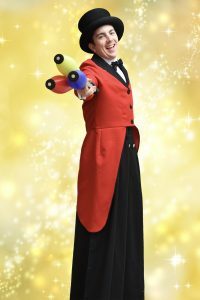 There’s also the chance to try Jamie Jigsaw’s circus masterclass, attempt a spot of custard pie clowning and get stuck into some circus-themed craft activities. Stagewise principal Ally Cox says: “With the phenomenal success of The Greatest Showman, circus fever is in the air and has really captured children’s imaginations. Everybody is welcome at our workshops and you don’t need to have any experience of performing. Children can come along, make new friends and above all have a lot of fun. Posted in Circus, Ragazzata on 28 July, 2018 .